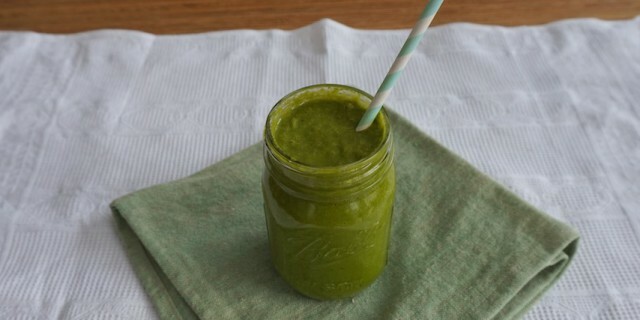 This Spicy Turmeric Green Smoothie with sea buckthorn boosts your immunity, fights inflammation and speeds up your recovery after a work-out. Ginger and turmeric boast powerful anti-inflammatory properties. Both are used traditionally to prevent a common cold. Sea buckthorn is a also powerful anti-inflammatory and antioxidant. The small orange berries have a sourish taste and are nutritional powerhouses. Sea buckthorn is very rich in vitamin C and A, a variety of bioflavonoids and carotenoids and essential fatty acids (omega-3, -6, -7, and -9). Sea buckthorn is becoming popular amongst athletes to boost energy levels, reduce inflammation and speed up recovery. You can buy the berries frozen here from this brand. Blend all ingredients in a high-speed blender to a smooth consistency and enjoy your Spicy Turmeric Green Smoothie right away!